DeQuervain’s Tenosynovitis is a form of tendinitis which will lead to pain along the thumb side of your wrist. Lifting with your thumb pointed up (rather than palm up or down) can lead to overuse of two specific tendons on that side of your wrist. It is common in new mom’s and new grandmother’s who are repetively lifting small children, but it can occur in anyone who is lifting or pulling repetively. The overuse will lead to swelling around the tendons. Over time, the sheath (tunnel) in which the tendons run can get thickened and cause rubbing on the tendons. 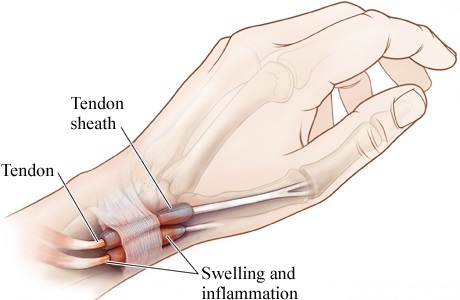 Patients will experience pain along the thumb side of their wrist right over the tendons as they run in their sheath. Bending your wrist toward the thumb will be painful and putting your thumb in your palm and bending our wrist toward the little finger side will be very tender. Occasionally patients will note swelling in the area. Less commonly you can actually develop a cyst off of the tendon sheath which can go up and down in size. The simplest thing you can do is make a concious effort to avoid lifting or pulling with your thumb pointed up. This means lifting with your palm facing up or down in order to decrease the repetitive stress on the tendons. Ice, rest, and anti inflammatory medications can be helpful as well. A wrist brace which supports the wrist and immobilizes the thumb has been shown to be helpful as well. If these simple treatments don’t work, an injection of cortisone (strong anti inflammatory) around the tendons can be very successful. It will usually take several weeks of non operative treatment to see relief. If pain does not improve with non operative treatment, there is a surgical procedure which can be done to release the tendon sheath and thereby decrease the rubbing/irritation on the tendons. This requires a very small 1 inch incision and can be done under just local anesthesia. Sedation can be performed for those who are anxious, but general anesthesia is not required. The procedure takes about 10 minutes and is performed at an outpatient surgical center. The wrist is put into a splint for 10 days until stitches are removed in the office. It is important to keep the wrist immobilized in order to prevent the released tendons from popping out of their appropriate location. Return to work is usually 2-6 weeks depending on how rigorous your work activities are and if light duty is available for you. If this sounds like something that has been bothering your wrist, call Dr. Murch today at 715-847-2382 to schedule an appointment.